Halogen ovens are designed to cook food fast and easily, it has the speed of a pressure cooker and the cooking mechanism of a traditional oven. Your reason for wanting a halogen oven might be different to someone else’s. Maybe your normal oven isn’t big enough for your needs and you need some extra space, or perhaps you don’t have space in your kitchen for an built-in oven. Whatever reason you have, this guide will help you decide which one is right for you, from size to budget to speed of cooking. For your convenience, below is a detailed analysis of the best halogen ovens available and their key features capacity (how much food do you need to cook) and power (how quickly do you need to cook it). 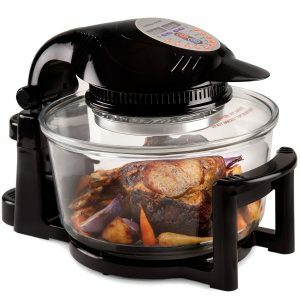 Which Halogen Oven Cooker to Go for? Designed with a chef in mind, Andrew James Digital Halogen Oven is changing how food should be cooked. It’s 128-page comprehensive recipe booklet will change dinner time in every household. It has a 2-hour timer along with a defrosting and a reheating setting to improve the culinary experience for any busy schedule. Forget greasy dishes, this oven has a self-cleaning setting that eliminates the need to clean dirty pans. With a temperature that ranges to a max of 250C the digital system provides more precise control. This appliance comes with a wide selection of cooking utensils such as skewers, tongs, toast rack, high and low rack, baking/steamer rack and rice/cake dish. A replacement halogen bulb along with a 2-year manufacturer warranty provides necessary confidence when maintenance due. Uses 1400w which is a bit more energy but significantly less than a traditional oven. 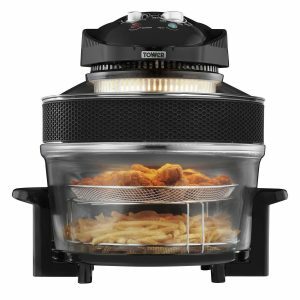 Cook pork chop, BBQ chicken or even baked goods with the Tower Health T14001 Halogen Air Fryer. With an ability to drastically reduce oil intake by 80% without sacrificing great taste, this oven is for any diet conscious health enthusiast (check out our best Air Fryer guide here for more). The pan is tempered glass, easy to clean and scratch resistant. The defrosting setting is a time saver as it allows frozen food to thaw effectively. While using three energy system including infrared, halogen and convection heat every meal can be cooked to perfection. This 17-litre oven is large enough to roast a whole chicken without creating mess or using multiple pans. Using only 1300watt, this oven comes with tongs, 2 mesh tray, oil sprayer, lid stand, and a recipe booklet. Extender ring increases the capacity from 12-litre to 17litre. Unhinged lid which would take up space in a small or busy kitchen. 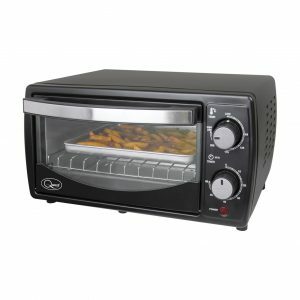 Using only 1300W this halogen oven can bake, grill and fry food in a 12L capacity or can be extended into 17L. With a 60-minute timer this Cookshop Halogen Oven will be the latest gadget in any hectic kitchen. The hinged lid ensures that every meal is cooked to perfection with no grease spillage. With a wide range of temperature between 125C to 250 this oven is designed to cook sensitive and tough food. The 3-year manufacturer warranty ensures that any product defect or malfunction is taken care off. With a set of cooking utensils including tongs, two trays high and low rack cooking has never been so easy. Uses only 1300w which saves energy. Product doesn’t come with a replacement halogen bulb. A utilitarian cooking devise that is designed to take the fuss out cooking, the Andrew James Halogen Oven will improve any busy schedule. The defrosting option ensures that frozen food can be cooked to perfection. Roasting, grilling, frying, baking and steaming can now be completed between 125C to 250C. Complete with an array of cooking tools including tongs, baking and trays, high and low rack, four skewers and even a replacement halogen bulb Andrew James left nothing out in their packaging. 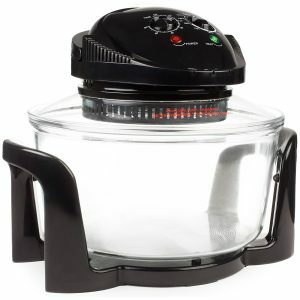 Using only 1300W, this halogen oven uses infrared heating to rapidly cook the food in the tempered glass container. The extender ring increases the pan capacity from 12-litre to 17litre which is enough space to cook a small whole chicken. One extender ring which increases the capacity from we to 17 Litres. An elegant silver colour made for a chef’s kitchen. Russel Hobbs Halogen Oven 18537, will take the stress out of cooking with a 60-minute countdown designed to prevent burnt food. The temperature varies starting as low as 125C to as high as 250C which is great for cooking a variety of dishes including meat and vegetables. Using only 1400W this oven is expected to cook food 40 percent faster. The most exciting element of this devise is the expansion ring which increases the cooking capacity from 11-litres to 16-litres. Have limited facilities or no time to spare? This oven will eliminate the need to use multiple pans to cook a whole meal. The tempered glass and stainless steel ring are easy to clean. Designed to fit every lifestyle, the Benross Group has created a one of a kind mini oven. Compact in size with a capacity of only 9L this mini oven will transform your baking and grilling needs. This energy efficient oven uses only 1000Watt which reduce your energy usage and increases your energy savings. Great for students or young professional, this appliance is extremely portable as the width is only 35cm. With a multi-level option that provides the ability to cook two meals at different temperatures this dynamic devise also has a minimum temperature of 100C and a maximum temperature of 250C. Cook with ease with the 60-minute timer and automatic shut-off mechanism that ensures safety after cooking. A fraction of the size of a conventional oven the Daewoo Deluxe Halogen Oven will turn any armature cook into an expert. This is the only portable cooking appliance you need in your kitchen that is perfect for steaming vegetables cooking meat, poultry and baking desserts. Suitable for students or retired people who want a hassle-free cooking appliance. The oil spray bottle encourages healthy eating by reducing oil consumption. This appliance comes with two mesh trays, one high and low rack, a set of tongs, one oil spray and an extender ring that increases the interior capacity from 12L to 17L. Forget to wash, the self-cleaning feature means that grease clean-up is a thing of the past. In a hurry to cook, no need to waste time and energy pre-heating the oven because this halogen oven uses less electricity as it cooks instantly. Unhinged lid takes-up counter space. Start a healthy diet with the Salter EK 1950 Low Fat Fryer. With 50 recipes, enjoy the endless possibilities of frying, roasting, grilling, steaming and baking. Steam vegetables and grill meat simultaneously without having additional dishes to clean-up. This technologically advanced cooking devise eliminates the waiting time associated with defrosting food with the triple cooking power; halogen, convection and infrared. Convection heat circulates the glass pan while infrared heat penetrated the food and finally halogen heats the surface; all three-heating energy combines to maximize taste. 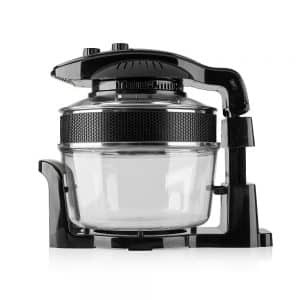 The clear glass container removes the guessing game when cooking and makes it more efficient to clean. Uses 1400W which means it uses a bit more energy. 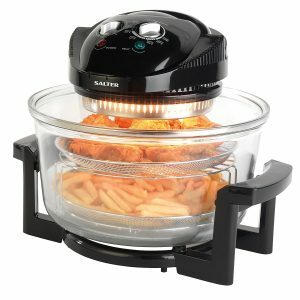 Replace old fryers with the Sentik 12-litre Premium Halogen Oven. 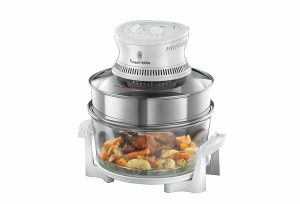 A technologically advanced halogen oven designed to streamline the cooking process using a triple heating technology. Save time baking, grilling and frying as high heat, infra-red waves and convection whirlwind accelerate the cooking process by 50%. Equipped with tongs, high and low rack this oven is designed to simplify the culinary experience for anyone with a busy schedule. With a timer, a wide variety of temperature setting and an easy to use dial this functional kitchen pan is also easy to clean and scratch resistant. Made from tempered glass, the pan provides the opportunity to monitor food while it cooks. A truly one of a kind Black Halogen Convection Oven that redefines the culinary experience in a small pan. The Michael James Premium oven base capacity is 12-litre with the addition of the extender ring an extra 5-litre is created to have a max capacity of 15-litre. Weighting only 6kg, with a clear tempered glass pan and a black stand, this compact appliance is designed to fit into any kitchen. Taking into consideration sensitive food, this oven starting temperature is 65C and maximum temperature is 250C which ensures both fragile and tough food are cooked thoroughly. The safety feature includes the 60-minute timer along with the automatic shut-off that is activated when the lid handle is raised to reduce cooking hazards. The selection of utensils such as tongs, high and low rack makes this a great teaching kitchen appliance for children and family. 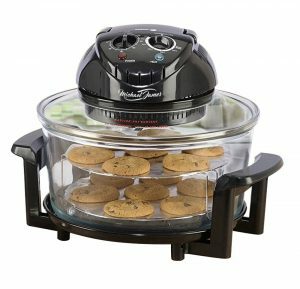 Best quality & features – The Andrew James Digital halogen oven is the most versatile oven due to the number of features it has such as the self-cleaning option and the two-hour timer. The fact that it has a digital control system means that grilling or baking can be accomplished at a specific temperature. For a master home chef, this oven comes with a set of unique cooking tools such as acake dish, toast rack and a steamer rack. On a budget – Over the last couple of years, it’s had a significant price reduction which makes it more affordable and accessible to everyone. The Sentik 12L Premium Black Halogen Oven is around £30 at regular retail price which makes it extremely affordable when compared to other ovens which retail at around £60. Equipped with the essential cooking tools such as tongs, low and high rack it uses both halogen heating and convection system. This product provides more advanced heating system at a bargain price. The lightest option – The Quest Mini Oven weights only 3.3kg which is significantly less than most halogen oven which weigh 8kg. This oven is much smaller than most with an interior capacity of 9litres. It only uses 1000Watts which makes it perfect for cooking day to day snacks. It’s also incredibly safe as it’s among the few ovens that have an auto shut-off function. Along with the adjustable temperature control and timer its simple design and light weight structure makes it a great buy. 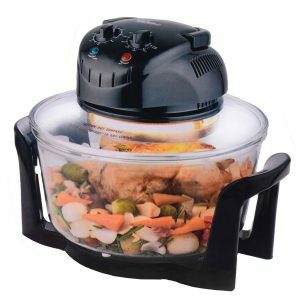 Reliability – The Cookshop 17L Digital Halogen Oven with hinged lid is the most reliable as it has a 3-year warranty which is great for product malfunction and when broken pieces need to be replaced. It comes with a set of cooking utensils and uses a digital dial for accurate cooking. The pan interior capacity is 12L but an additional 5L capacity can be created with the extender ring. Child friendly – The Michael James 17L 1400W halogen oven is the safest to use around children because of the automatic shut-off mechanism that’s triggered when the lid handle is raised which reduces cooking hazards. The clear pan will ensure that baking cookies with the kids will always be a fun and exciting event. Similar to any kitchen appliance such as a blender, kettle, a toaster and even a microwave, halogen oven is becoming a necessary household item. As the general population are slowly becoming familiar with this exciting product there are a couple of things to consider when purchasing this essential kitchen item, they are; control function, size / weight, and utensils. Each product is designed to suit a specific need or group such as families, chefs, and single people, so it’s important that a customer understand their shopping needs. The more conventional halogen oven uses a dial control system, while the technologically advanced ovens are digital. Digital control provides the opportunity to cook at a specific temperature. This option is great for bakers and for cooking more sensitive food like vegetables. There are really two part to the control function one is the timer and the other is the temperature setting. Do you have a small or big kitchen? This question is very important because it will determine which product is purchased. People with smaller kitchen should consider purchasing a smaller halogen oven because it uses less space and can be stored in a small corner. The weight determines how heavy the product is for example, the lightest halogen oven weights 3.3kg while the heaviest is between 8 to 9kg. The great thing about a halogen oven is that regardless of the weight it’s still a small appliance that can be stored in a cabinet and used for special occasions. Eighty percent of halogen ovens come with some form of utensils to help facilitate the cooking process. The most basic utensils are tongs, low and high rack which seems simple enough but is great to have because it’s designed specifically for the product. Also, some products come with a recipe booklet and may require the use of a specific tool as part of the instructions. Many single people and health fanatics are raving about halogen ovens because it cuts cooking time in half. 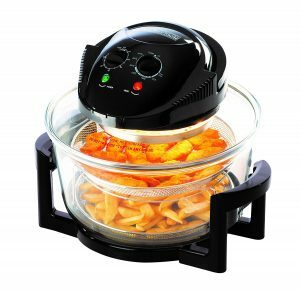 As people are becoming more energy cautious time is money, halogen oven is the more advanced method of cooking food rapidly without sacrificing taste. Unlike a microwave, it can thoroughly cook a wider variety of food such as vegetables, poultry, and baked goods at a specific temperature. Essentially, it’s a quarter of the size of a traditional oven but still provides the same function at a rapid speed. So how does it work? The main cooking mechanism is extracted from the lid which is essentially a circular filament filled with halogen gas which controls the lamp, when the lamp is activated it creates instant heat. A traditional oven is large which sometimes makes it inefficient for cooking smaller meals because it needs to preheat before it can begin cooking. In fact, experts say that it cooks food 60 per cent faster than a traditional oven. The time it takes to pre-heat a traditional oven the Halogen oven would have completed cooking a small dish –this is what makes it so effective. A high percentage of halogen oven pans are transparent glass which makes it fun and easy to cook food without the need to take off the lid. Although some critics have argued that it uses more energy per hour, more research shows that its ability to cook food quickly in less time means it saves more money in the long run. This energy and time saving information is one of the biggest motivator for most customers. You don’t usually get much steam with a halogen oven but if you do, you could consider a getting cooker hood with an extractor fan on (see here for the best cooker hoods and kitchen extractor fans). Cleaning is always the worst and unsatisfying part of cooking, unlike a traditional oven that requires one to put some elbow grease into it, the halogen oven is enjoyable to clean as it requires just a wet cloth, soap and some water. The more expensive ovens have a cleaning function which ultimately eliminates the need to clean the pan. Andrew James Digital Halogen Oven and Deluxe Halogen Oven are the two best-selling ovens with self-cleaning setting. Both are higher-end products aimed at customers who are looking to use the oven repeatedly on a day-to-day basis. Food will always bring people together but how we cook is what makes the difference in taste. Although halogen ovens look like a futuristic slow cooker –which can be very intimidating, it’s actually very simple to master when compared to the traditional range oven. Generally, price of this oven is based on the number of features it has, for instance, the cheapest halogen oven will have a dial button, limited temperature options and will be small. The more expensive option may come in two colours (white or black), have an extensive list of utensils, a recipe booklet, a replacement halogen bulb and a longer manufacturer warranty. The beauty of this product is the speed at which is cooks yet still maintaining taste and quality. At the end of the day it’s all about function and usability, as size, weight, capacity and price all play into the users buying decision. Halogen ovens are simple enough to use and as the industry is slowly moving from a dial to a digital control system this cooking appliance will become more user friendly. It’s ability to cook at a rapid speed is what make this product an essential kitchen appliance. 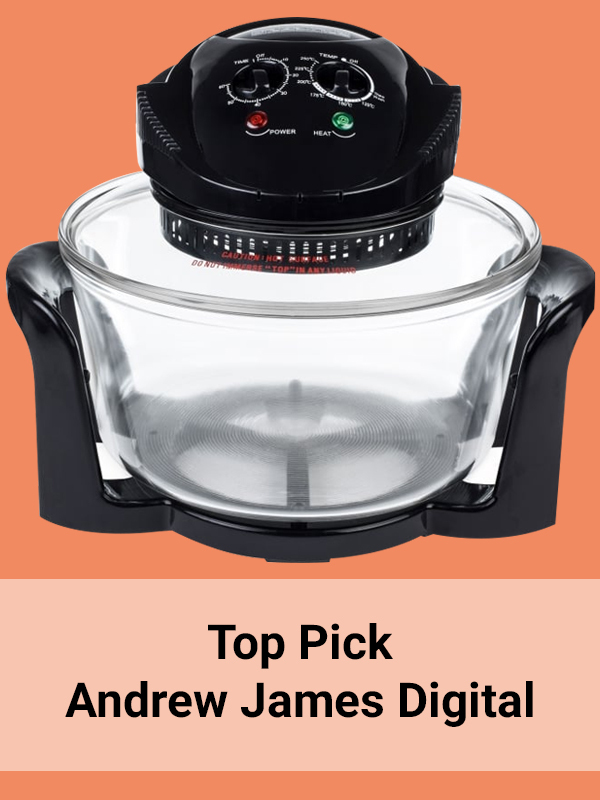 I just got my Andrew James Digital Halogen oven and wondered if you could recommend any recipes?